Here's a perfectly timed book choice for the festive season. Wreck the Halls was written by Meg McKinlay and published by Walker Books (2012.) It's one of the Lightning Strikes series, easy-to-read chapter books aimed at primary kids. Wreck the Halls features characters McKinlay used in two earlier books she wrote for Walker - Going for Broke and The Big Dig. $500 prize money! Yes! This Christmas decorating comp is too easy. Decorations? No sweat. Strategy? Who needs it? What on earth could go wrong? I really enjoy McKinlay's books. Previously, I've read and reviewed Duck for a Day, The Truth About Penguins and No Bears. You'll be unsurprised to learn that Wreck the Halls is my new favourite! I think that's because I can so easily imagine this book converting kids who used to believe they didn't enjoy reading. It's a fun romp with believable characters whose adventures make us giggle. 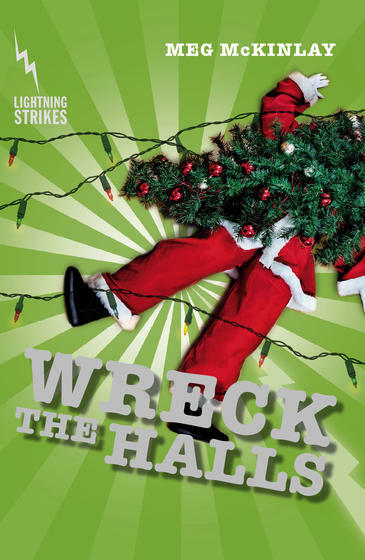 As soon as I'd read Wreck the Halls, I found myself wanting to race out and find some kids to share it with. It would make an excellent choice for a classroom or library read-aloud serial, one where kids will be urging "just one more chapter." I think it would also be a great gift for primary kids, especially boys who love action and humour.